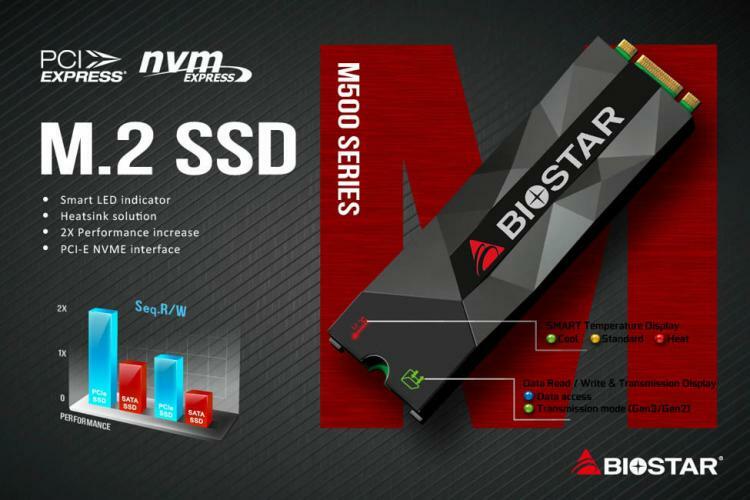 BIOSTAR expands its solid-state drive line-up with the new M500 M.2 PCIe NVMe solid-state drive series featuring 3D TLC NAND flash. The BIOSTAR M500 packs high-speed performance of up to 1700/1200 MB/s sequential read and write. The BIOSTAR M500 sports unique smart LED indicators for temperature monitoring and data transmission status. The M500 is offered in capacities of up to 1TB. The BIOSTAR M500 is compatible with both M.2 PCI-express and M.2 SATA interfaces to give builders better flexibility with the storage drive. The BIOSTAR M500 SSD also packs two smart LED indicators on its front heat spreader, one for real-time temperature status and one for data read/write transmission status. The Smart temperature LED display has three colours by default: green for temperatures below 50°C, yellow 50°C~65°C, and red for above 65°C. The Smart temperature LED indicator is also programmable to give users the freedom to assign their own LED colours. The BIOSTAR M500 PCIe SSD sports a stylish gaming heatsink that offers improved cooling and a gaming look that will fit any gaming PC. The BIOSTAR M500’s power-efficient 3D NAND flash uses less power compared to previous generation solutions offering better battery life for notebooks and ultrabooks. The BIOSTAR M500 is available in 128GB, 256GB, 512GB and 1TB capacities with an MSRP of $59, $99, $149 and $269 USD respectively. No information on availability as of this writing.